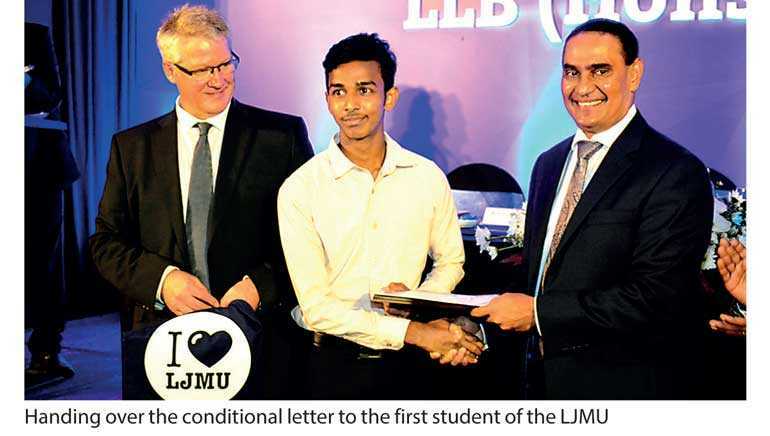 SLIIT recently broke new ground when it launched a historic new British LLB (Hons) Law Degree program in affiliation with UK’s prestigious Liverpool John Moores University (LJMU) at a special ceremony held at the Cinnamon Grand in Colombo. The collaboration combines SLIIT’s wealth of experience offering renowned academic and practical programs and LJMU’s recognition as one of UK’s largest, most dynamic and forward-thinking universities. In attendance, representing LJMU were Prof. Peter Byers, Pro Vice Chancellor, Education and Sir Jon Murphy, Professor of Advanced Policing Studies. Representing SLIIT were Chancellor Prof. Lakshman Rathnayake, Vice Chancellor Prof. Lalith Gamage, Faculty of Humanities and Sciences Dean Dr. Malitha Wijesundara and International Dean Prof. Mahesha Kapurubandara. Students can complete SLIIT’s new three-year LLB (Hons) Law Degree program in Sri Lanka and transform into competent legal professionals equipped with the knowledge and skills required to successfully engage in traditional local legal careers, work in the corporate world or join international organisations. “In our objective towards becoming a multi-disciplinary comprehensive university, we are aim to produce relevant and high quality experts including law professionals to support the development of the country,” Prof. Gamage added. Students can complete the three-year degree program in Sri Lanka which offers comprehensive modules of challenging and thought-provoking legal topics, including fundamentals of English law, and optional modules covering specialised areas of law such as human rights, animal rights, financial crimes, banking, international law etc. The degree’s strong industry focused curriculum also includes mooting, mediation and negotiation preparing students in dispute resolution. “The LLB (Hons) Law Degree is an exciting new addition to the suite of undergraduate programs offered by SLIIT. The faculty has worked together with LJMU to provide students an innovative approach to legal education including hands-on learning to help students gain the knowledge, skills and confidence they need to become effective lawyers serving the profession well into the future,” noted Dr. Wijesundara. Through this LJMU collaboration SLIIT students will have access to a wide range of up-to-date law databases and e-resources and an expert and experienced panel of lecturers gaining vital analytical and problem-solving skills required to develop their expertise in law. Registrations are now open for the 2018/2019 intake of the LLB (Hons) Law Degree. The academic entry requirements include three passes in one and the same sitting in any combination of subjects at the GCE Advanced Level (Sri Lanka)/Cambridge/Edexcel Examination, with a Credit pass for English at the GCE Ordinary Level Examination. Students are invited to apply via ijmu@sliit.lk, www.sliit.lk or 0766 378 351.